While road fatalities are the fifth highest cause of death for young people (14 to 29), it often does not get the same attention on a global level that other fatal causes receive. As a result, it was great to see that the issue of road safety was very prominently covered in Quito. As 40-50 percent of all road fatalities occur in cities, road safety has become central to the urban development agenda. Following the words of Jean Todt, President of the Fédération Internationale de l’Automobile (FIA) and UN Special Envoy on Road Safety: “Road safety must be part of sustainable mobility,” insisting that every mayor needs to prioritize road safety in his or her city. Elements included in the NUA may have profound impacts on advancing the ambitious SDG target 3.6 of halving road fatalities and injuries by 2020. The approach is new, as it gives priority to design and planning, concentrates on vulnerable users and connects to other agendas (climate, air pollution and physical activity). It is an evolution from traditional road safety approaches, which used to focus on vehicles and behavior, through education and enforcement. Road safety was prominent in the Habitat III agenda. For instance, it was the topic of Transport Day’s opening plenary and of nine side events and special sessions featured in the conference programme. The Global Road Safety Ambassador for the UN Decade, Michelle Yeoh, was also present. She insisted on the importance of reducing speeds, providing safe road crossings and segregated bicycle tracks, for saving kids’ lives. Child safety is a goal sought by FIA Foundation’s Global Initiative for Child Health and Mobility, of which WRI is a partner. During Habitat III, FIA Foundation released a touching video, directed by Luc Besson, which speaks to this issue. The Safe Systems Approach to road safety, which was pioneered in the early 1990s in the Netherlands and Sweden, aims for a more forgiving road system that takes human fallibility and vulnerability into account. It accepts that people make mistakes and are defenseless; that it is necessary to create a road system where crash forces don’t result in death or serious injury; and that it is necessary to strengthen all parts of the system: roads and roadsides, speeds, vehicles and road use—so that if one part fails, other parts will still protect the people involved. Countries in the Organization for Economic Cooperation and Development (OECD) adopted the Safe Systems Approach, and it has been effective in reducing fatalities and serious injuries. It is remarkable that the New Urban Agenda includes explicit language, which motivates action in this direction in low- and middle-income countries, which concentrate 90 percent of the world’s traffic deaths. That is the case, for instance, in Bogotá, Colombia, which announced the adoption of Vision Zero in the revision of its road safety plans, with the support of Bloomberg Philanthropies Initiative for Global Road Safety. An important element in the Safe Systems Approach is reducing speed limits. While we see many cities in the global North taking action—like Paris, with a citywide introduction of 30 kilometers per hour (19 miles per hour), and New York City, with a widespread speed limit of 40 kilometers per hour (25 miles per hour)—there are few examples in emerging economies like Mexico City and São Paulo. These actions immediately show the impact of speed limit reductions, with 18 percent and 22 percent annual reduction in traffic deaths, respectively. Pedestrians, bicyclists and motorcyclists make up 49 percent of traffic deaths. The New Urban Agenda gives special recognition to their needs and identifies vulnerable populations: women and girls, children and youth, people with disabilities, elderly and the poor. This acknowledgement fits very well with the refrain heard throughout Habitat III: “no one left behind.” With this language, road safety programs in cities shall have specific provisions for vulnerable groups. In the New Urban Agenda, there is specific language for motorcycles. While motorcycles are the fastest growing mode of transport in developing countries, they are also the fastest growing group of road crash victims. The special consideration of motorcycles would help advance safe strategies for this group, including design, wearing helmets and vehicle features. The New Urban Agenda promotes a reduction in car use and an increase in walking, bicycling and public transport as a means to achieve more inclusive and sustainable urban mobility (see, for example, paragraph 112). This is replicated in the road safety paragraph, under the understanding that these transport modes help in reducing air pollution and increasing physical activity. Ambient air pollution was responsible for 3 million annual deaths. Low- and middle-income countries disproportionately experience the burden of poor air quality. In addition, poor mobility systems lead to inactive and unhealthy populations. Approximately 3.2 million deaths each year are attributed to insufficient physical activity. Walking and bicycling can help meet the minimum physical activity levels recommended by WHO, while also helping achieve climate change mitigation targets. Meeting the ambitious SDG goal of halving road traffic deaths and injuries by 2020, requires strong action by national and local governments. If multi-level governmental actions come to fruition, such as the approval of the new road safety bill in India and the participation of city leadership in the Bloomberg Global Road Safety Initiative, this goal may become a reality. While the commitments in the New Urban Agenda provide excellent guidance, it needs to be followed by political will, advances in institutional capacity and smart budget allocation. The New Urban Agenda and its implementation highlight new approaches to road safety, such as strong integration with land-use planning, sustainable mobility, Safe Systems Approach, focus on vulnerable users, consideration of motorcycles, acknowledgment of broader health, sustainability and social impacts and emphasis on children’s journey to school. 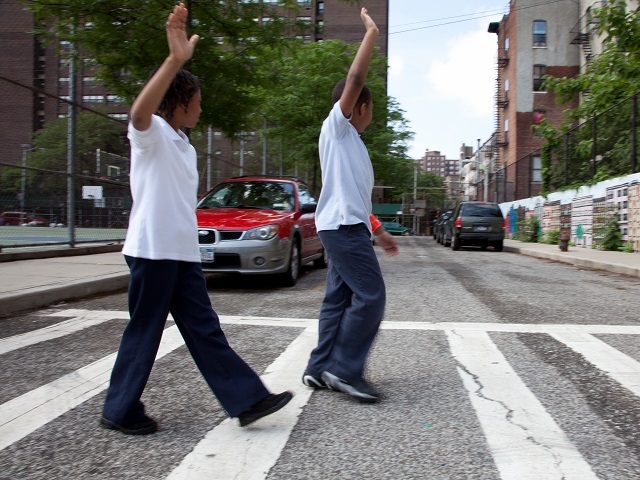 It is time to move towards an extended vision zero: zero traffic fatalities and injuries, zero air pollution and greenhouse gas emissions and zero exclusions. WRI Ross Center for Sustainable Cities, with the generous funding of Bloomberg Philanthropies, has identified the connection between sustainable mobility and urban design with road safety. WRI publications “Saving Lives with Sustainable Transport” and “Cities Safer by Design” provide global references to illustrate the importance of shifting travel to walking, bicycling and public transport and smart urban development. The partner organizations will continue to support the governments of Bogotá, Fortaleza, Sao Paulo, Accra, Addis Ababa, Mumbai, Bandung, Bangkok, Ho Chi Minh and Shanghai, in their efforts to advance road safety and sustainable mobility. WRI also works with FIA Foundation to advance the road safety global agenda.